Any successful money management program will have a plan to manage debt. Lets get start by firstly looking at your real situation (It’s important to keep emotion out of this process for now ok? No blaming, wishing it wasn’t so.). Just look at the facts and find out the truth. Now for the 7 steps. 2. Beside each one write Total Bill , Monthly Repayment and Ratio (see step 3). What we are now going to do with this plan, is look at these ‘many” bills as just “one”. The reason for this is that your BIG BILL will become less each time one of the smaller bills are paid off. But your big payment will stay the same until the last bill is paid in full. 4. 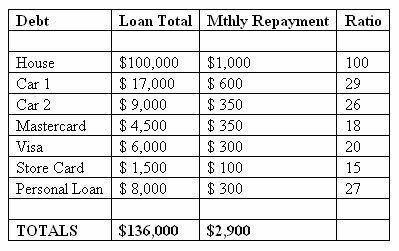 Divide each repayment into the total amount of debt to arrive at a ratio. E.g. House Loan Total is $100,000 divided by $1000 for each monthly payment will give you a ratio of 100. Yes? (notice I’ve used easy figure for easy of mathematical examples). Now do the same for ALL the bills. 5. Take the extra $290, add it to the LOWEST ratio debt e.g. Pay Store Card $390 each month until that is paid out. Alternately, you can use the income from your residual income program instead of 'taking' from the family income. 6. Then go to next lowest ratio e.g. Mastercard and make Total payment to that $250 + $390 you were paying on the store card. You are keeping the total debt payments to $3,190. 5. As each bill is paid for you take what you were paying for that and add that amount next bill. So by the time all your small bills are paid for, with this debt reduction plan, you now can add ‘more’ to your bigger bills like the car and house. Sticking to this debt reduction plan will mean you must COMMIT to redirecting your spending! AND STICK WITH IT!. This debt reduction plan WORKS! NOTE:	Another way of reducing your debit is to pay out the shortest number of months bill first, then add that payment to the debt with the highest monthly payment. Maybe in the above case VISA, so when that is paid out, you actually will have $290+$100+$300 =$690 more total $$’s to use on the next bill which will help with the speed of debt reduction. Everyone who has a job wants and needs an extra $500-$2000 a month. Here's my favorite residual income program.